Tile flooring is a classic that works well with any décor. With a varied selection of materials, styles, and colors, this versatile and affordable flooring complements modern, rustic, and traditional decorating schemes. Come into our showroom to see and touch the porcelain tile, slate tile, and ceramic tile flooring for yourself. Talk with one of our sales professionals about your vision for your new flooring. We will help you find what you are looking for and provide you with selection, service, and value. Our flooring store offers you hundreds of choices in ceramic, slate, and porcelain tile. Select tile in the color, shape, size, and type that delights you. This type of tile is made from clay that is fired in a kiln, which makes it strong and durable, an ideal choice for a busy home with lots of foot traffic. Ceramic is softer, lighter, and less dense than porcelain or slate tile flooring, making it easier for cutting and tile flooring installation. Ceramic is one of the most cost-effective choices for tile. It costs less than porcelain or slate. If budget is one of your priorities in choosing flooring, we recommend that you consider ceramic tile. 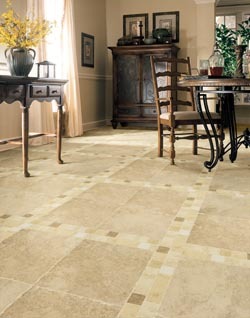 Porcelain tile is dense, strong, and highly resistant to moisture, making it a versatile and desirable flooring option. Porcelain is harder than ceramic and a bit more versatile because it can be made to look as glassy as granite or marble. The way porcelain is made gives it a clean, modern look that works well with any style of décor. Our flooring showroom provides you with hundreds of styles and colors of porcelain tile that enhance any room. Slate is a type of stone flooring that is formed by layers of sediment. As you can well imagine, this flooring is incredibly long-lasting and tough. It resists moisture and even fire. This natural flooring requires little in the way of maintenance. Sweeping and mopping with a mild detergent keeps this stunning flooring clean and appealing. Slate tile flooring comes in a variety of intricate natural colors that complement any décor. Even the lightest tile – ceramic – is heavy, compared to other types of flooring and requires professional installation. Then, too, cuts must be made in individual tiles to fit properly in a room and this requires proper, professional tools. Our flooring store will send our experienced and skilled technicians to your home to lay your flooring. For long-lasting beauty, it is essential that tile be laid flat and properly grouted. With professional installation, you can enjoy your handsome tile floors for many years. Want to learn more about our tile flooring? Call our showroom. Ask about our 12-18 month financing options. We proudly serve the communities of Santa Barbara, Isla Vista, Mission Canyon, Montecito, and Summerland, California.